Bibliotecha goes to Radical Networks, New York! 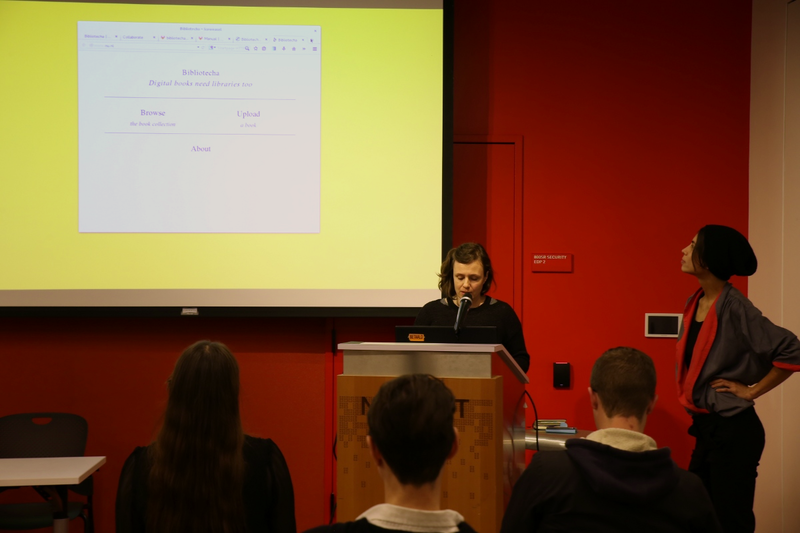 Andre, Lucia and myself had the chance to present bibliotecha at Radical Networks conference at Polytechnic Institute of New York University (MAGNET) in collaboration with EYEBEAM on 24th –25th October, 2015. 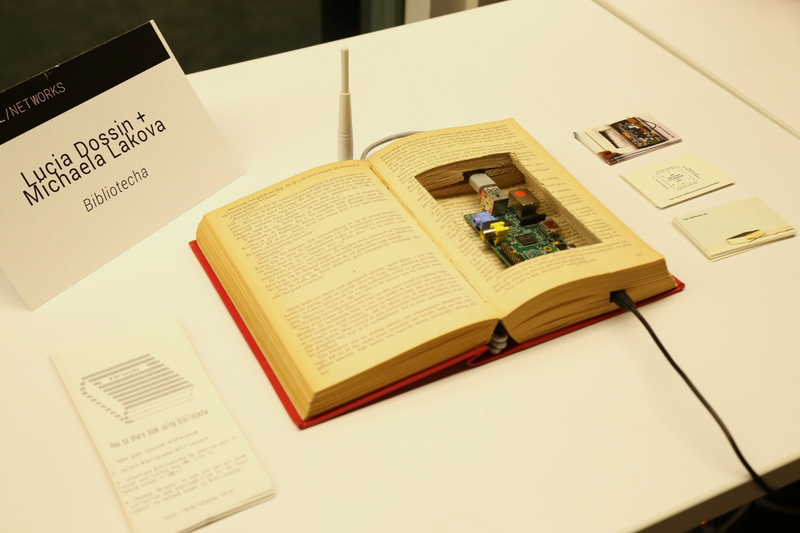 Bibliotecha project was present during the event through an installation, which provided a local book distribution network for the participants and audience, a short presentation and a workshop. The workshop group of participants consisted of developers, designers, illustrators, a community garden leader and NYC Public Library developer. 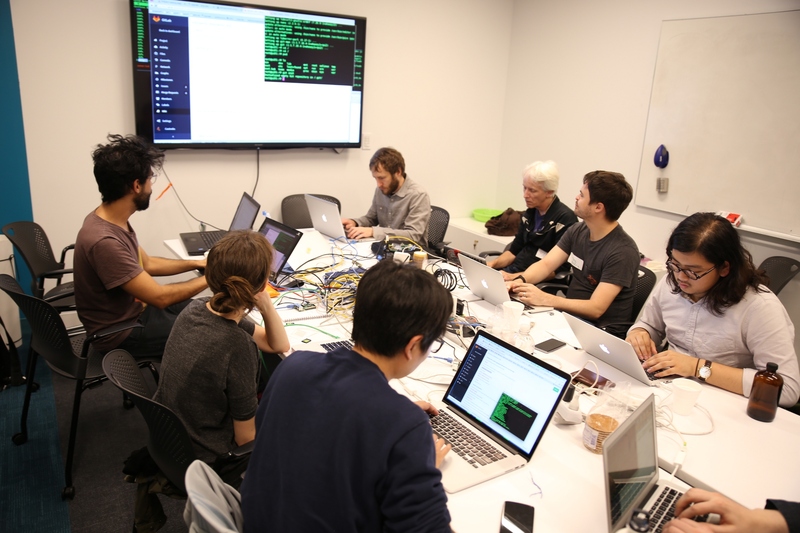 The participants although coming from different context, and having different expectations were all familiar with programming specifically text-based Unix programs (command-line tools). This helped us to achieve the workshop goals in the short span of time available. Given their knowledge we were also able to solve a couple of issues that occurred during the process. These strategies were noted down during the workshop and currently incorporate Bibliotecha’s manual and the body of knowledge that develops around the project. By the end of the work session, all participants had a working Bibliotecha node, which they could bring home and use further 🙂 An interesting discussion on Bibliotecha and other book-sharing tools and strategies took place towards the end of the workshop about possible implementations of bibliotecha. For instance NYC busy subway network was discussed as a potential infrastructure to facilitate free sharing of electronic books. Our participation at Radical Networks also made us more certain of the potential of bibliotecha and are string to further developed into a more stable tool, but also to seeking alliance with other collective that speculate on the future of books and reading, such as Hackers and Designers initiative and Read-in collective. & Big THANKS to Sarah Grand, Erica Kermani & Amelia Marzec for organizing Radical Networks! Our participation at Radical Networks was made possible with the financial support of Small Contribution Voucher generously provided by Creative Industries Fund NL.